It’s been so cold lately. I don’t know if it’s because I just got back from a holiday in the Northern Hemisphere* and I’ve gotten acclimatised to shorts-and-sandals weather, and too-hot-to-breathe humidity (thankfully only for a couple days), but I’ve really been feeling the cold these last few days. Maybe all that holidaying has turned me weak. But maybe it isn’t just me. According to Metservice yesterday’s low got down to 3.6 degrees, and I believe it. I can’t remember the last time my fingers and toes went numb on my walk to work. It might have been some years ago when I spent a winter in Chicago (now that was cold! ), but certainly not in Wellington. 3.6 degrees (that’s Celsius for you Americans reading this). That got me thinking: that’s not too far from freezing. And then all that thinking about freezing got me thinking about ice cream. 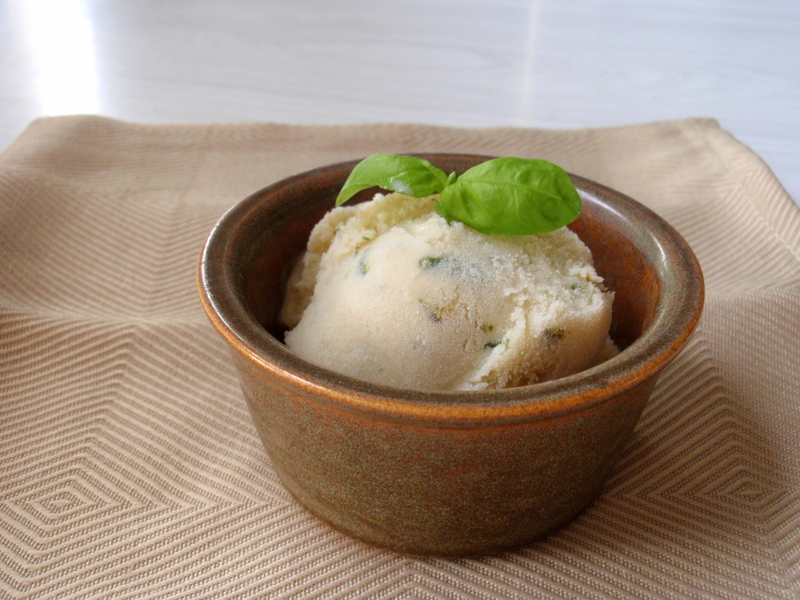 Specifically, this basil ice cream I made before going away. There’s a place for ice cream in winter. Sure, the easiest way to incorporate it into your winter dessert routine is scooped onto one of those aforementioned hot, comforting desserts, where it will melt and mingle with the aforementioned gooey sauce and make everything taste that much creamier and more amazing. 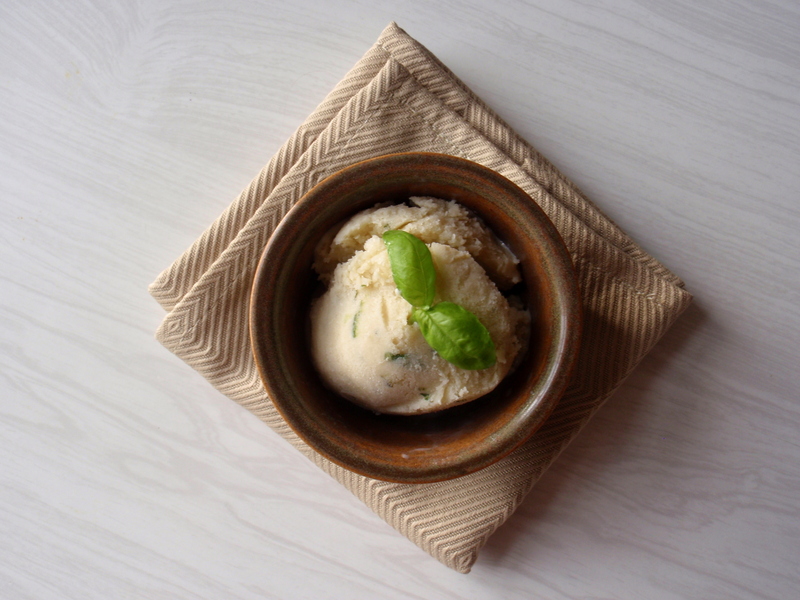 But there’s a place for ice cream on its own, too. Like when you’re so full of the richest, darkest, meatiest beef stew, or roast chicken and vegetables**, when you’ve eaten so much bread slathered with butter and dipped into gravy, when you’ve taken a second (third!) helping when you know there’s no room left but you’ve gone and done it anyway because good lord it’s cold and dark outside and the wind’s threatening to blow your house down. And then you get a craving for something sweet, but you’ll burst if you eat a big heavy pudding: that’s when you need that scoop of ice cream. The other times I can think of when ice cream’s okay in the dead of winter include: if you’ve just come out of oral surgery or a long-term relationship, or if you’re at the movies (specifically at the Paramount and you’re sitting in one of the smaller theatres with the plush comfy chairs and you’re still rugged up from the cold outside, and you’ve got a chocolate-dipped cone of Kapiti apple crumble ice cream). Also if it’s a particularly warm, sunny winter day*** and you’re feeling really optimistic about the days getting longer and summer eventually coming back around again. 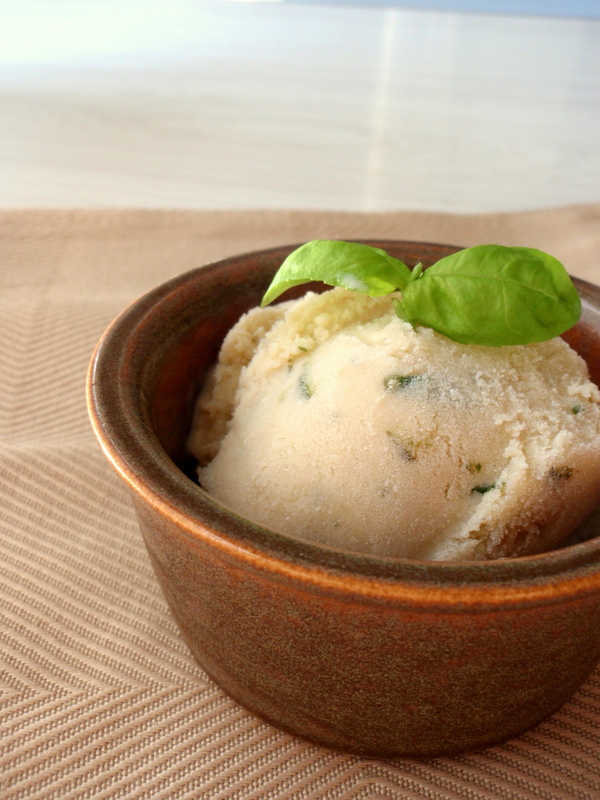 Anyway, if it’s sunny this weekend and you want to forget about the season, this ice cream is about as summery as you can get: the hint of fresh basil, a bit of zing from the lemon zest, cool and creamy on your tongue. 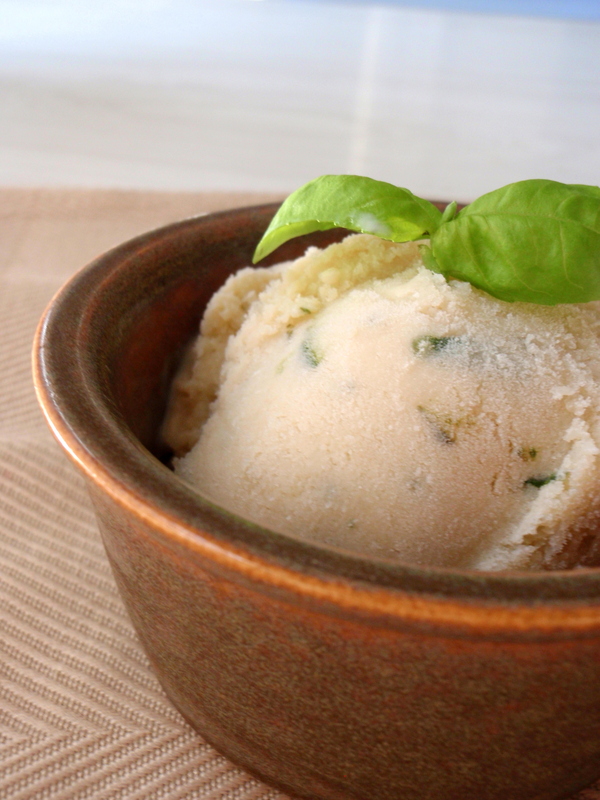 If you’re thinking basil ice cream sounds weird, yes, it’s a bit different, but not that far off mint. 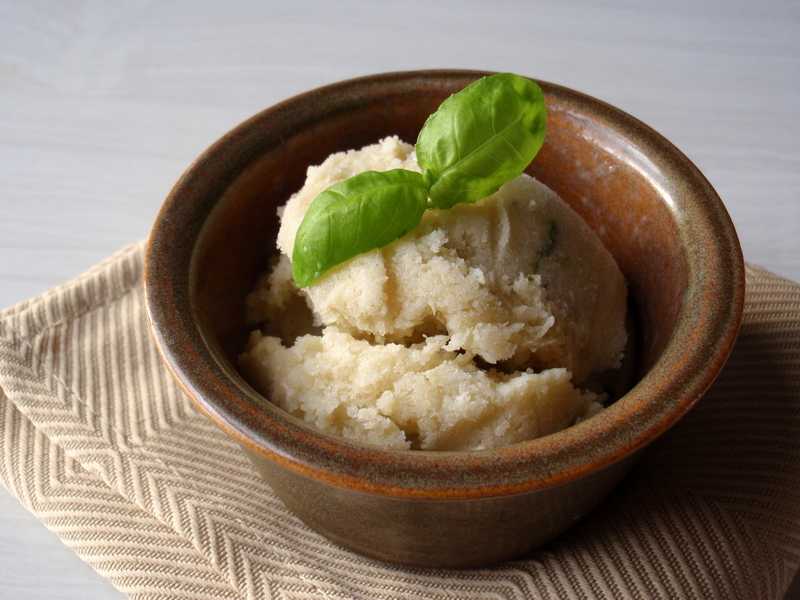 And the heady herbaceousness of the basil kind of fades into a mellower aromatic hint as it freezes, so it’s really like eating a creamy, custardy ice cream with a touch of something a little bit different. It’s perfect on its own (after a rich, heavy winter meal) or would be perfect with a slice of lemon cake. *it was a crazy, totally illogical whirlwind trip through four countries (and four times as many flights) in 18 days and despite all the transit time I loved every minute of it. More soon. **not so much if you’ve just eaten a big comforting bowl of soup. Then you’re probably fine sticking with pudding. ***I know, I know, I live in Wellington. But look at the forecast for the weekend! A girl can dream. 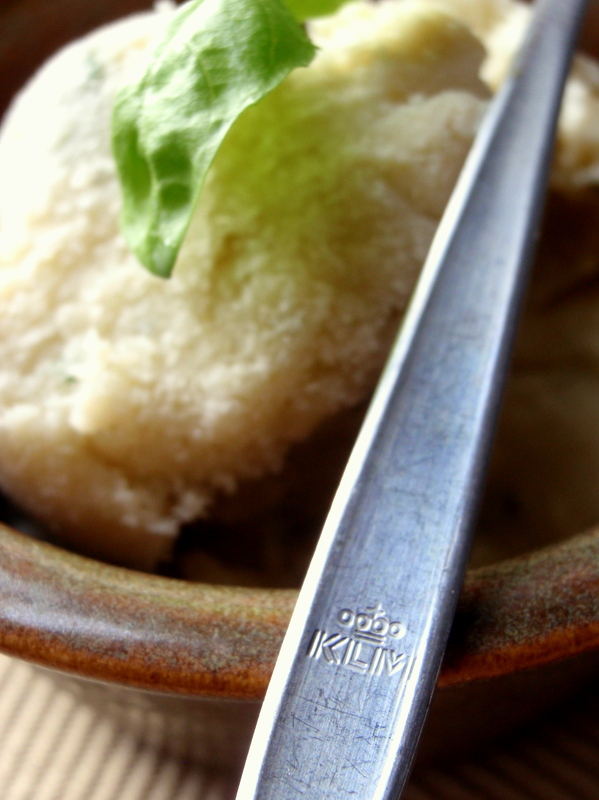 Put 2 cups milk* in a saucepan with 1 cup basil leaves**, warm over medium-low heat until steaming hot. Cover, remove from heat and let it steep for a while – the original recipe says 1 hour but I wasn’t that patient and may have only left it for 20-30 minutes or so. Strain out the basil leaves using a fine-meshed sieve, smushing the leaves down at the bottom of the sieve to get as much moisture out as you can. Reheat the mixture (now a pleasant mint-green colour) so that it’s nice and warm again. In a bowl, whisk together 4 egg yolks, a pinch of salt and 1/2 cup sugar. Pour in the reheated greenish milk mixture, but do it slowly, whisking as you go, so the mixture stays nice and silky smooth. Pour this all back into the saucepan and cook it over medium heat, stirring with a wooden spoon, until the mixture is thick enough to coat the back of the spoon. If you have issues with the custard separating, do as Laura says in this Hungry and Frozen post and have a sink full of cold (ice?) water on the ready to plunge the pan into. And stir like crazy. Let cool, then refrigerate until completely cold, then freeze. If you have an ice cream maker, great! If you don’t (like me), make sure you stir it every so often to keep the texture nice and creamy. *Feel free to use cream in place of (some or more) of the milk – I just used what I had at the time. **I used most of the leaves off one of those basil plants you can buy at the supermarket. P.S. That spoon? Part Two of my series of old, cast-off airline cutlery. For Part One, see this post. P.P.S. I actually was meaning to write about my recent adventures in Sydney, the States, Mexico and Tokyo but instead I’ve just talked heaps about ice cream in winter. Which is fine. But maybe in a future post: what I’ve been up to for the past month!